Editor's Note: For more kid's comics as can be found in THE TOON TREASURY, be sure to check out Cole's Comics follower Mykal Banta's The Big Blog of Kid's Comics! We are living in the golden age of comic book reprints, my friends. 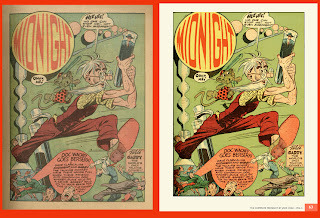 Aside from digital versions of comics opening up entirely new areas of appreciation and study of old comics (such as this blog), many fine reprint books have been published in the last couple of years. If you are in your mid-40's and grew up in the United States, then you'll probably get a little involuntary surge of excitement when I say: 100 Page Super Spectacular. These amazing wedges of mostly golden age reprints that DC Comics published in the 1970's were where I first got my interest in golden age comics. A stray Lou Fine BLACK CONDOR, an Eisner BLACKHAWK, and yes... even a Jack Cole PLASTIC MAN. Ah, those first heady exposures to the weird, wacky, great comics of the past! For years, for decades since, we haven't had nearly enough reprints to satisfy those yearnings to read more and more of the great old comics. And then, all of sudden, we've got an absolute FLOOD of the stuff! 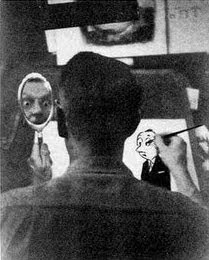 Truth be told, the vast array of old comics follow the late author Theodore Sturgeon's law: all art is 90% crap and 10% great. So the next step is not to just mechanically reprint, reprint, reprint... but to add something of value. To sift out extraordinary comic book stories and put them into a structure that says something about their inherent value and connection to similar story forms. To present the material on the printed page in a way that is both true to the original presentation, but also somehow enhances it. These, I would submit, are the goals of any good to great comic book reprint collection. 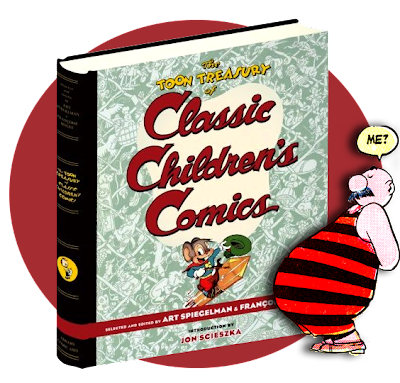 And that's precisely what Toon Treasury: Classic Children's Comics, the new book created by Art Spiegelman and Francois Mouly does. I cannot recommend this magnificent volume enough. It collects stand-out comic book stories into a framework that is both organic and illuminating. 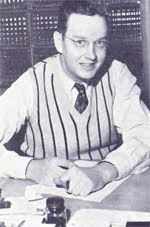 Great stories by Carl Barks, John Stanley, the criminally underappreciated Sheldon Mayer, Walt Kelly, Basil Wolverton, Harvey Kurtzman, and George Carlson are woven into a continuum that leads you to more obscure, but just as enjoyable works such as INTELLECTUAL AMOS, FOX AND CROW, and GERALD McBOING BOING. This thick tome weighs over 3 pounds and has 350 pages of comics. The retouching is excellent, preserving a sense of the original printed works, and yet enhancing the vitality of the images. The printing is some of the best I've seen in comic book reprint book and it's printed on non-glossy paper, to my everlasting appreciation. Reprinting artwork that was originally presented on porus, pulpy paper onto shiny, glossy pages is a tragic mis-representation and an extremely stupid artistic choice. Thankfully, some of the modern comic book reprints, including this one, use a soft, non-coated paper stock. The Toon Treasury is a bargain at $40.00, but right now (late August, 2009), it is an incredible deal as it can be ordered on Amazon for only $26.40, and you get FREE shipping! It all began when my parents in Louisiana passed on, about 3 years ago. My mom died from a lingering illness just after Thanksgiving and my father went from an unexpected heart attack the day after Christmas. So here I was, in early January 2006, sifting through my parents' possessions. They rented, and so I only had a couple of weeks to deal with their stuff. Before it all got packed up, sold, thrown out, and mailed to my home in Seattle, I decided to spend one night there by myself, with everything as it was when my parents last were alive. It was a little creepy, as they had both passed on in the very room I was sleeping in. In my father's bedroom, I found a stack of old comic books by his bedside, mostly old issues of Little Lulu and Tubby. I settled down on an air mattress on the floor, totally alone in the dead of a Lousiana night to read some of these comics that my mother had bought when she was a kid, in Ponchatula, Lousiana. I came across an eerie, oddly poetic TUBBY story called "The Guest in The Ghost Hotel." In the story, Tubby is trapped in a pool of quicksand. When night falls, an old hotel rises up underneath Tubby, as it does every night. He finds himself on the roof of it, and he climbs down into the hotel through an open window. Inside, he encounters ghosts living in the rooms. He is relentlessly pursued by the proprietor, an angel of Death, to register and become a permenant resident. The whole story is a minor masterpiece, and totally unlike anything you'd expect to find in a funny kid's comic. 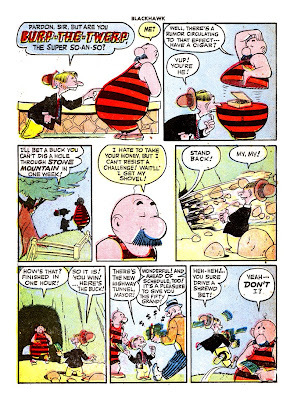 I shared this story, which was written and drawn by John Stanley, with my friend, Frank Young, and he was instrumental in it's inclusion in the Toon Treasury. In fact, the story was scanned from my own copy of Tubby #7, the very copy I found in my parent's apartment. My friend Frank Young also put this amazing story on his Stanley Stories blog, with some excellent critical comment here. 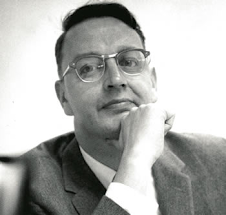 Aside from my own minor involvement, there is another reason I am mentioning the book in this blog, and that is it reprints Jack Cole! For the first time I know of, Cole's weird and wonderful BURP THE TWERP one-pagers see the light of day in a quality reprint book. There are only 3, but they are great ones, from Police Comics # 35, 38, and 46. The beautiful thing about this book is that it will almost certainly turn a whole new generation on to the greatness of the form. I am so looking forward to receiving my contributor's copy (hint, hint Abrams!) and sharing it with my 9-year old son. 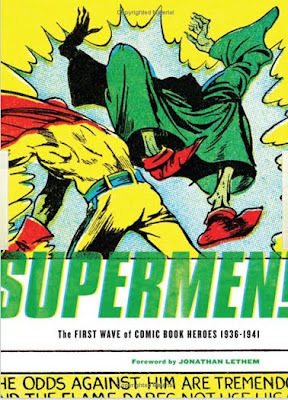 Another top-notch and highly recommended reprint book that has considerably more Jack Cole work in it is Supermen! 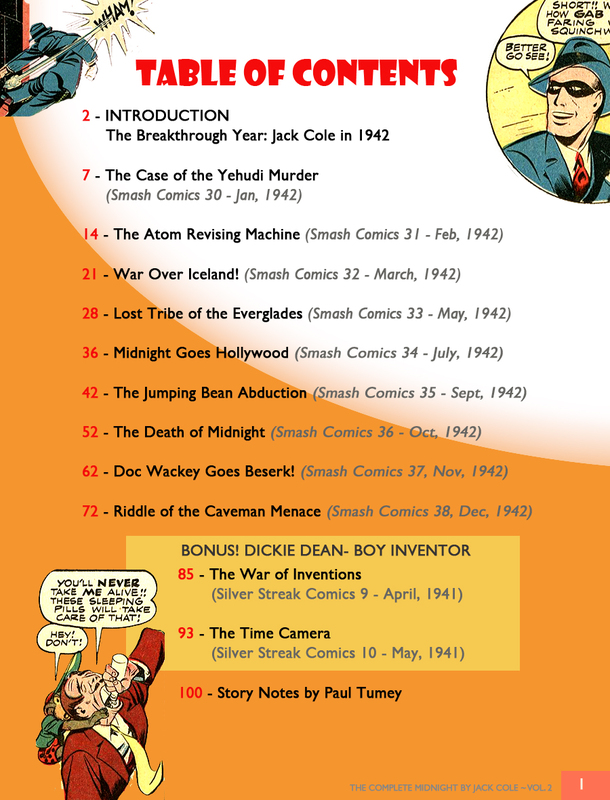 : The First Wave of Comic Book Heroes 1936-1941 by Greg Sadowski. Like Toon Treasury, this book is a well-chosen, and superbly presented collection. 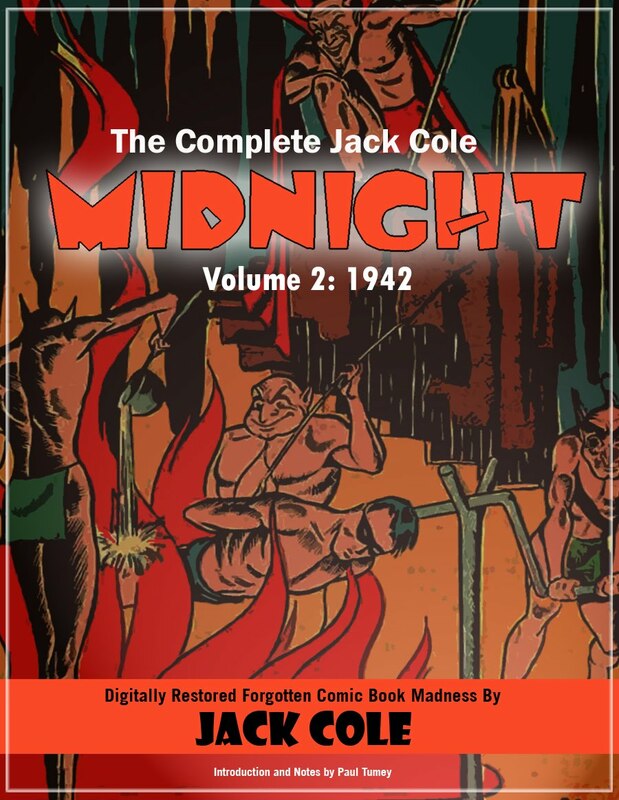 In addition to great early work by Will Eisner, Basil Wolverton, Fred Guardineer (a personal favorite of mine), and Bill Everett, we get a great big helping of nicely reprinted early superhero stories by Jack Cole. 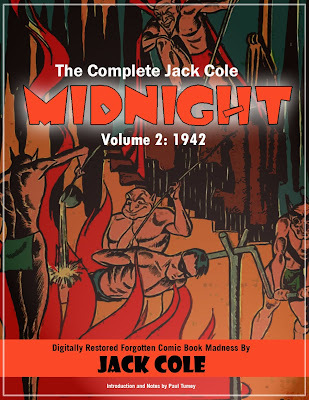 With 36 of the book's 175 pages of reprints, Cole's work gets more attention than any other artist in the book. There is a great COMET story, an amazing SILVER STREAK story, and perhaps THE stand out story of Cole's early pre-Quality work: "The Claw Battles Daredevil." Currently, this treasure sells for only $16.49 on Amazon. 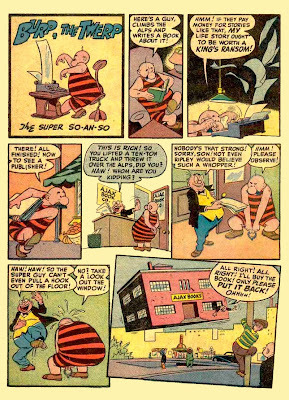 Jack Cole's BURP THE TWERP was a fascinating character. A superhero himself, he was a parody of the formula, being a pudgy bald man, with a shaving brush mustache. Like PLASTIC MAN, Burp was able to alter his form, seemingly at will. He had an endless supply of startling super powers. 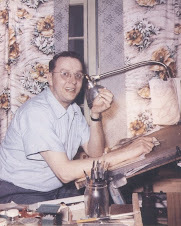 During his 12 or so years at Quality Comics, Jack Cole contributed an estimated 400-500 one-page comic stories. I've read that he often liked to warm up to creating a PLASTIC MAN story by first creating one of these one-pagers. They are often filled with graphic invention and fresh energy, and deserve to be considered on their own as a major part of the body of the work of this comics master. For the most part, a character stayed in a single comic. SLAP HAPPY PAPPY in Crack Comics, DAN TOOTIN' in Hit Comics, WINDY BREEZE in National Comics, WUN CLOO in Smash Comics, and BURP THE TWERP in Police Comics. We'll look at all these comics in later postings. 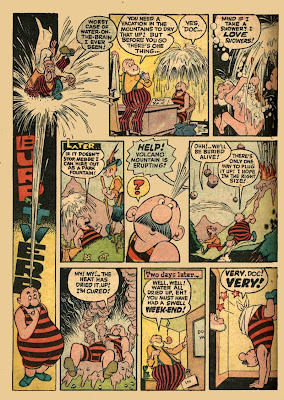 For now, here's three of BURP THE TWERP's appearances in comics other than Police. Due to it's low price, the SUPERMEN! book was an easy purchase for me to make, sight unseen.. With the higher-priced stuff, I usually like to take a gander at it (in-store) before buying 'em. Though judging from the writeups I've read thus far,-- this one (too) sounds like a winner! For someone my age (soon to be *gulp* 47 years-old ?! ),-- it seems that "reprints" are almost ALL I buy nowadays.. I am 47, as well. I buy and read a LOT of reprints, myself. Although many of the reprints are new to me. I'd say 90% of the material in SUPERMEN! was fresh for me. It would be interesting to know what modern comics Jack Cole fans read. I very much like the modern comics of DAN ZETTWOCH. His use of information diagrams and penchant for nicely designed pages with sign-painterly titles reminds me of Jack Cole. His enthusiasm and spirit for the form is also very much like Cole's. His website is: http://www.danzettwoch.com/. Anyone else out there have a good contemorary graphic storyteller to recommend?